I don’t know about you, but for a long time I considered cooking from scratch to be something that only chefs or crazy people did (ha!). I’ve since discovered how easy it is to make from scratch so many of the things we never even thought twice about buying. 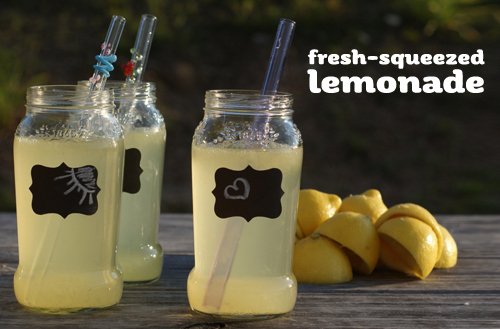 And I’ve also discovered a few fun recipes along the way too, like homemade lemonade, which is delicious and refreshing! In a small saucepan, combine 3/4 cup water and sugar and heat over medium-high heat, until the sugar is dissolved into a simple syrup. While that’s cooking, juice your lemons. TIP: Roll your lemons on the counter, pressing down with the heel of your hand, to make them easier to juice. In a pitcher, combine the simple syrup, lemon juice and cold water. Refrigerate until chilled, about 30 minutes. Add 1 bunch of basil or mint to the saucepan to make a flavored simple syrup. Strain before combining with the lemon juice and water. Add a pint of pureed strawberries for easy strawberry lemonade. 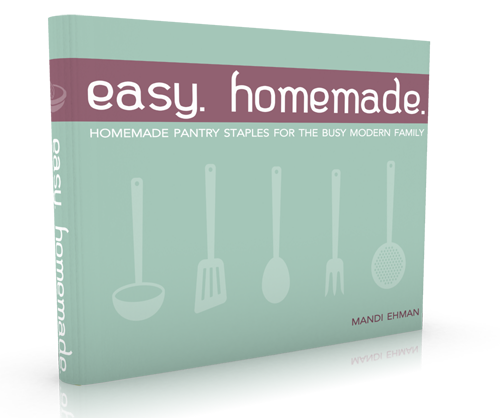 Discover more than 60 recipes for homemade kitchen staples like these in Easy Homemade, which is available for your Kindle, Nook or a full-color PDF to read on your computer for just $0.99 this week only! PLUS, the first 100 readers to use coupon code DSM100 will get a FREE PDF copy of the ebook. But even if you miss that code, you can pick up your copy – including several great bonuses – for just $0.99! Mandi Ehman lives in wild, wonderful West Virginia with her husband of ten years and four beautiful, spunky little girls. As a full-time work-at-home, homeschooling mom, she runs Life Your Way, a site that blends intentional and creative living, and Jungle Deals & Steals, where it’s all Amazon, all the time. I just got a free copy, thanks so much! What a great book! Thanks for telling us about this great book – I’ve purchased my copy & am looking forward to looking through it. I couldn’t get the code to work yesterday, but today, it did. Thank you so much. Just got my free copy – thanks for the code and heads up! Have a great week!